Today we’re announcing a significant milestone in serving our mission customers from cloud to edge with the initial availability of two new Azure Government Secret regions, now in private preview and pending accreditation. Azure Government Secret delivers comprehensive and mission enabling cloud services to US Federal Civilian, Department of Defense (DoD), Intelligence Community (IC), and US government partners working within Secret enclaves. 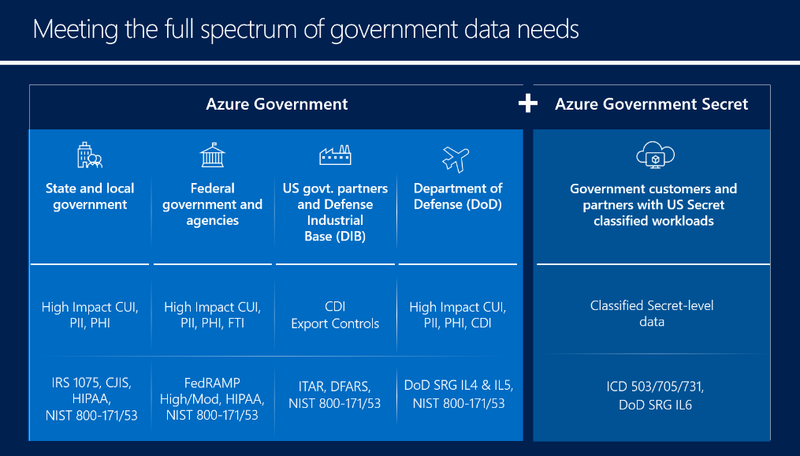 In addition, we’ve expanded the scope of all Azure Government regions to enable DoD Impact Level 5 (IL5) data, providing a cost-effective option for L5 workloads with a broad range of available services. With our focus on innovating to meet the needs of our mission-critical customers, we continue to provide more PaaS features and services to the DoD at IL5 than any other cloud provider. For more than 40 years we have prioritized bringing commercial innovation to the DoD. We also continue to help our customers across the full spectrum of government, including every state, federal cabinet agency, and military branch, modernize their IT to better enable their missions. Microsoft is helping customers across the full spectrum of government, including departments in every state, all the federal cabinet agencies, and each military branch, modernize their IT to better achieve their missions. Azure Government Secret delivers comprehensive and mission enabling cloud services built with additional controls to support US agencies and partners with workloads classified by the US government at the Secret level. In addition, we’re continuing our commitment to deliver government workloads across the full range of data classifications. Developed using the same foundational principles and architecture as Azure commercial cloud, the Azure Government Secret regions are built to maintain the security and integrity of classified workloads while enabling fast access to sensitive, mission-critical information. These dedicated datacenter regions are built with additional controls to meet the regulatory and compliance requirements for DoD Impact Level 6 (IL6) and Director of National Intelligence (DNI) Intelligence Community Directive (ICD 503) accreditation. Azure Government Secret includes two separate Azure regions in the US located over 500 miles apart, providing geographic resilience in disaster recovery (DR) scenarios and faster access to services across the country. In addition, Azure Government Secret operates on secure, native connections to classified networks, with options for ExpressRoute and ExpressRoute Direct to provide private, resilient, high-bandwidth connectivity. These new regions operated by cleared US citizens are built for IaaS, PaaS, SaaS, and Marketplace solutions, bringing the strength of commercial innovation to the classified space. These secure regions will deliver an experience that’s consistent with Azure Government, designed for ease of procurement and alignment with existing resellers and programs. For more information on the private preview program, Azure Government customers can reach out to their sales representative. Azure Government Secret is available to agencies and their partners with authorized access to a connected US Government classified network. Based on mission owner feedback and evolving security capabilities, Microsoft has partnered with the DoD to expand the IL5 Provisional Authorization (PA) granted by the DoD to all Azure Government regions. This expanded coverage provides customers with more PaaS features and services at IL5 than any other cloud provider. This expanded range of PaaS services means mission owners can leverage managed services to be more productive. For example, development teams can use Azure App Service to quickly create cloud apps using a fully managed platform, or Azure SQL Database for a fully managed relational cloud database service that provides the broadest SQL Server engine compatibility. In addition, mission owners will benefit from decreased latency, expanded geo-redundancy, and additional options for DR and budget optimization. Today, more than 25 services are available across all Azure Government regions at IL5, and these new systems will accelerate access to new IL5 services as they become available in Azure Government. Customers should note, when supporting IL5 workloads on Azure Government, that isolation requirements can be met in different ways. The isolation guidelines for IL5 workloads documentation page addresses configurations and settings for the isolation required to support IL5 data. In addition to rapidly releasing services for the full spectrum of government data, we’re continuing to develop programs to help customers ensure security and compliance requirements are met, audited, and enforced. We recently launched Azure Blueprints, which integrates with Azure Policy to help teams manage and enforce governance for specific compliance outcomes. Azure Blueprints is a free service that helps customers deploy and update cloud environments in a repeatable manner using composable artifacts such as policies, deployment templates, and role-based access controls. This service is built to help customers set up governed Azure environments and can scale to support production implementations for large-scale migrations. Look for new blueprint services for Azure Government supporting FedRAMP and DoD SRG coming soon. With the initial availability of two new Azure Government Secret regions, now in private preview and pending accreditation, the expansion of DoD IL5 coverage to all Azure Government regions, and the extended Azure Blueprints program, we’re continuing our investments in innovation, security, and compliance to help customers across the full spectrum of government. Microsoft enables the digital transformation of government by offering effective, modern, enterprise-class cloud capabilities. We are dedicated to helping our government customers accomplish critical missions with innovative and trusted cloud, productivity, and mobility solutions. We support nearly 10 million US government cloud professionals across more than 7,000 government agencies and remain committed to delivering the highest level of security and compliance necessary to meet their unique needs.